by Annie Loughlin. Do not reprint without permission. Before Old Irish there was Archaic Irish (alternatively known as “Primitive Irish”), or Gaeilge Ársa, which is found on some of the earliest ogham inscriptions that survive in Ireland. These inscriptions are thought to date to as early as the fourth century C.E. (possibly a century or two earlier), and Archaic Irish is the earliest known form of a Goidelic language. It only survives in fragmentary form due to the fact that the ogham inscriptions are pretty limited in the kind of information they convey, so we don’t know too much about it. Old Irish, or Sengoídelc, evolved from Archaic Irish, and it is the language that was spoken in Ireland from around the seventh to the tenth centuries C.E. 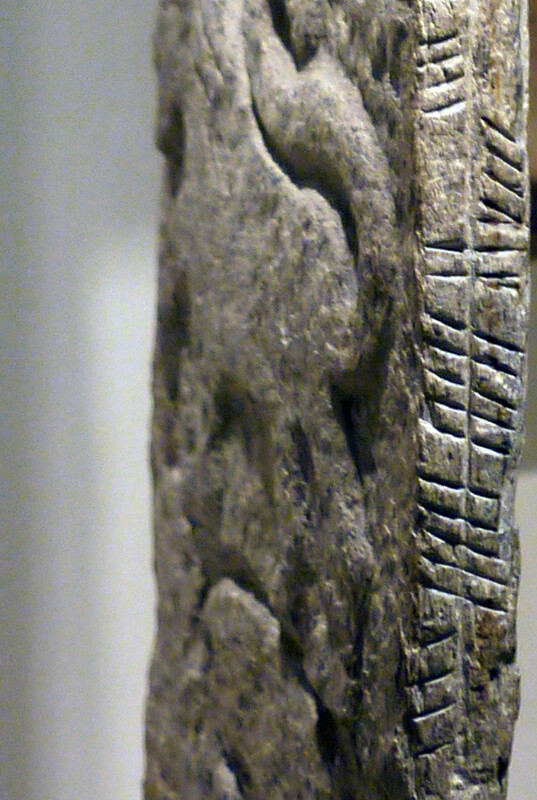 It is also the language that is found in some of the earliest written sources that we have – manuscripts detailing the myths, annals, laws and literature of early Ireland – and these include the names of many deities, words and phrases that may be relevant to Gaelic Polytheism, and Gaol Naofa in particular. A lot of the literature you will probably end up reading – whether it’s the myths or more academic literature that talks about them, or some of our articles and pages here – will default to the Old Irish spellings a lot of the time. Learning some of the basics of pronunciation for Old Irish can therefore be a big help, even if you don’t intend to learn the language in more detail. For one, it helps remove a potential distraction; you begin to read the words easily instead of fumbling and stumbling over them, so you can concentrate on the content instead of worrying about what the hell that word is. It can also help you gain more confidence in your practices. Really, it’s a win all round. The pronunciation of Old Irish can be very different when we compare it with modern Irish (or Scottish Gaelic, or Manx, which are also Goidelic languages), so things can get a little confusing sometimes. While there are some very obvious similarities between the languages, since they have a common origin, there are also some very obvious differences when it comes to pronunciation, so what applies to one language doesn’t necessarily apply to another. As far as Old Irish goes, there are some very basic rules that can be followed, which can help you get the hang of things. Remember, though, while these rules apply to Old Irish, that doesn’t mean they necessarily apply to modern Irish or any other Goidelic language! Compared to our modern English alphabet, there are a few letters missing, then. As with English, specific combinations of letters can produce specific sounds, so once we get the hang of the basic rules, pronunciation is pretty straightforward. Sometimes there may be exceptions to the rules (aren’t there always! ), but try not to worry too much about that. Before looking at how the vowels are pronounced, there are a few background details that we should look at. This will help you figure out pronunciations for yourself later on, and it will also introduce you to some terms that you will need to be familiar with if you decide to look into Old Irish in more detail. We’ll try to keep the jargon to a minimum, but some of these fancy terms are really necessary to know. When it comes to vowels, one of the most important things you need to know is that vowels are split into two groups: broad and slender vowels. This is why we tend to find the vowels listed in a different order than we might find in English — a o u e i, instead of a e i o u (as can be seen in discussions about the ogam alphabet, for example). Slender vowels (e, i) can affect the way certain letters are pronounced, and can cause palatalization. In most cases — and in very simple terms — this is where a ‘yuh’ or ‘uh’ sound is introduced into a word, like with the word bile (meaning ‘sacred tree’), pronounced BIL-yuh. Where slender vowels(e, i) are found with the letter s, we end up with a ‘sh’ sound. An example here is senchas (meaning ‘lore’) — pronounced SHEN-uh-chas. In this case, the slender vowel also slenderizes the syllable after it, giving an ‘uh’ sound between the sen- and -chas. Sometimes consonants can change their sound depending on where they are in a word. As a general rule, b, c, d, m, p and t all change their sounds depending on whether or not they appear at the beginning, or in the middle or end of a word, for example. However, when the same letter is repeated — such as in the name Ólamm — the initial pronunciation is kept. In this case, the ‘mm’ will give a ‘m’ sound, whereas on its own (at the end or middle of a word), m would usually give a ‘v’ sound. ch — never a ‘ch’ sound like chance, always pronounced as in loch or when a Scottish person says och! In most cases (for our purposes) the first syllable of the word is always stressed, and remember — this can sometimes change the way some letters are pronounced, as in the case of a and e, above. Here are some names, words and phrases that you might find useful, with suggested pronunciations, which should give you an idea of how all of the above works in context. Getting to grips with the basics can be confusing enough as it is, without having to learn the International Phonetic Alphabet (IPA) as well. For this reason, the pronunciations are given as simply as possible, although this means that they inevitably cannot be as nuanced or as accurate as they would be using the IPA. The capitalised syllable shows which part of the word should be stressed (where applicable).